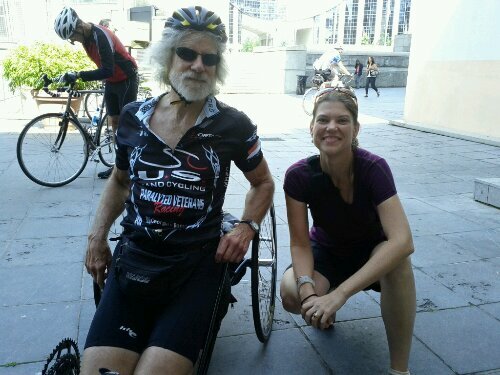 Bill Schwartz with MG. He’s riding a handcycle this year. Tonight I have a short mobile post from the RER train back to the PBP start area from Paris. 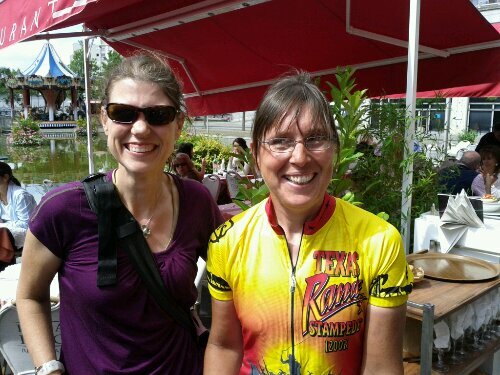 We felt a little draggy today and decided to get off the tandem and sightsee in Paris, but only after a stop by the. Campanile Hotel to see more rando pals and check out the bikes. 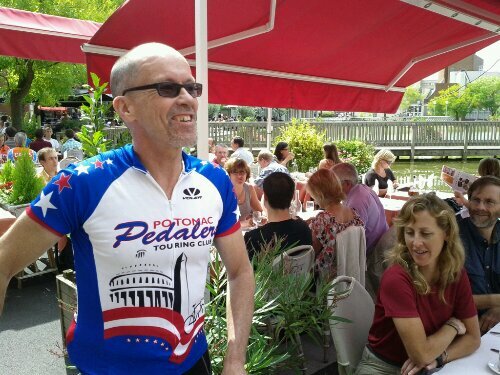 We saw Steve M, here to see wife Andrea off on Monday, Judith Swallow, who just completed PBP Audax, and John Lee Ellis of Colorado. We also greeted Kelly S. and wife Josie, and later in Paris Tom R. and family, so the gang is all here. Tomorrow we have DC Randonneurs group photo and turn in drop bags. Our 80-hour and 90-hour time limit friends then begin their countdown to the start Sunday afternoon; we look ahead to our 84-hour start on Monday morning at 5 am. As far as we know, MG and I are the lone USA tandem team in the 84 hour group. Folks are getting itchy to ride. The main event is almost here! Hotel Campanile is where our friends are staying. Maybe you’ll meet some of the Seattle contingent. One of them is Irish also.